It appears that regulatory authorities in the U.S. are increasing controls over horizontal directional drilling (HDD) at local, state and federal levels. Is this unneeded government incursion or the result of ever-falling industry standards? Experienced river crossing people are now far outnumbered by the inexperienced personnel. The productivity of work has been severely hobbled, while the number of people at an HDD job site has more than tripled. Steering tools continue to improve, yet acceptable pilot hole standards have declined and vary from method to method – incidents are on the rise and bad information is rampant. Anyone can steer a directional pilot hole and the only thing stopping new contractors from attempting a drill is that they have yet to take delivery of their rig. The experience void exists at all levels, exacerbating the problem. Those insufficient in experience and skill are writing drilling specifications for equally inexperienced contractors. Even the most experienced contractors are being compelled to follow improper specs. All the above leads to problems, which leads to overlooked details and issues. Good intentions are not enough. When it comes to pipeline engineering and construction, inaccurate information shouldn’t be acceptable. We can’t publish and then stand behind bad information. If you were an HDD subject matter expert tasked with writing the specifications for upcoming HDD projects and had read page 62 of those guidelines, why would you let anyone navigate a pilot hole with anything except a gyro? The guideline’s published facts are not accurate. The gyro is far from the most-accurate steering method available. The guideline is confusing due to its misuse of terminology. There are two basic HDD steering methods: walkover and wireline. A walkover refers to a receiver method used aboveground to locate an underground transmitter, which is not the system being discussed here. Wireline tools, magnetic and gyro, use a complex equation to calculate underground position based on data accumulated from surveys taken along the drill path. These are calculated surveys. Both the magnetic steering tool and the gyro steering tool are considered wireline, which refers to the spliced wire inside the drill pipe from the steering tool to the surface. The magnetic guidance system uses the earth’s magnetic field, and the gyro calculates using the earth’s movement. A tracking survey is an important capability used to precisely locate and verify a tool’s underground location using an artificial magnetic field. This feature only exists with magnetic steering tools. While it is possible to install a walkover system to try and locate a lost gyro’s drill path as it approaches the surface, as well as to couple a magnetic steering system with a gyro to track the drill path, a gyro cannot be tracked. 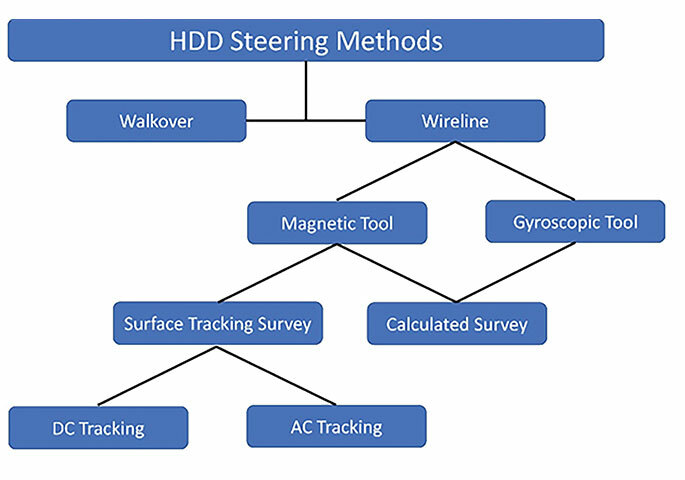 The most accurate HDD steering method is a magnetic steering tool properly set up, surveyed and operated using a direct-current (DC)-powered, artificial magnetic field. A gyro isn’t comparable, as it uses calculated surveys that have an ever-increasing error factor. The tool’s actual position cannot be tracked or verified. The location of bit or drill path is unknown until it exits the ground. The gyro has zero offset capability. It wouldn’t know if drilling against or directly under a steel pipeline, while the magnetic tool can sense the existing line. Not only can a magnetic tool with a properly set coil identify exactly where you are at all points, it also provides mag-range capabilities that can assist a bore parallel to an existing steel line. If accuracy is critical, the DC-tracked magnetic steering tool is far superior. A gyro may not have a depth limit, but neither does a magnetic steering tool. There have been HDD projects accurately drilled with a magnetic steering tool at a depth of more than 641 meters; the gyro has a history of elevation issues at standard pipeline depths. When it comes to accuracy, the magnetic steering tool system has multifaceted advantages over a gyro. The most important is the ability to verify its exact location below the ground. Proponents of the gyro claim its big advantage is that there is no need to set a surface coil. The truth is that a surface verification coil can’t be set with a gyro – only a magnetic steering tool can be tracked. Without tracking, both a magnetic steering tool and a gyro work off calculated data. Both have an increasing elliptical error factor. However, by tracking the magnetic steering tool, the error factor is brought back to zero at each survey. No such capability exists with a gyro, meaning the error ellipse continues to expand. In addition, the magnetic steering tool can sense its relationship to steel structures, and this information can be used to confirm and adjust the drill path’s direction. It should be noted that a gyro is a useful tool and provides a valuable addition to the HDD industry’s available techniques. There are projects where a gyro is the proper option. In fact, Horizontal Technology has developed its own gyro that works with the new DART steering system. This discussion is not anti-gyro, but a comment on the fact that industry efforts should focus on the safest, most-accurate pilot hole possible, regardless of brand or method. Good information and learning about something are valuable and can assist performance. However, information on its own is not experience. Learned knowledge must be applied properly. This is not a condemnation of those writing guidelines. At least they are trying to organize and educate the HDD industry, and that’s an upstream swim. They have stepped up and taken the point position at a time the effort is needed. Nonetheless, the emphasis on HDD safety needs to be recalibrated. Attention has drifted away from the importance of pilot hole accuracy. Safety needs to focus on the method and accuracy in which a pilot hole will be drilled. Owners, contractors, navigators, inspectors and especially safety personnel should be in complete coordination of how a pilot hole is designed, the precise location of each existing line, how each survey is verified and the degree of accuracy on the final documented as-built. HDD is the most effective environmental tool in the history of construction. It is important that industry guidelines remain accurate, otherwise where should an engineer, contractor or government regulator turn? These are exciting times for our industry and opportunities abound, but we should avoid shooting ourselves in the foot.